...Give your brain a good stretch by subscribing to the magazine admired around the world for its fearlessness, its range and its elegance. Please pay LRB Ltd. Direct Debits from the account detailed in this instruction subject to the safeguards assured by the Direct Debit Guarantee. I understand that this instruction may remain with LRB Ltd. and, if so, details will be passed electronically to my Bank or Building Society. For your convenience your subscription will be automatically renewed. 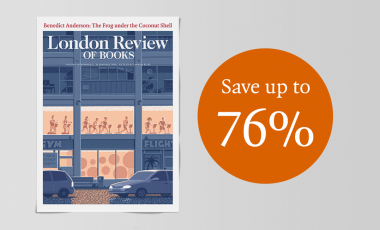 The London Review of Books will send a reminder notice before charging your credit/debit card. All other offers will receive a renewal reminder towards the end of the subscription term. All subscription types may may be cancelled at any time, and you will receive a full refund for unposted issues.